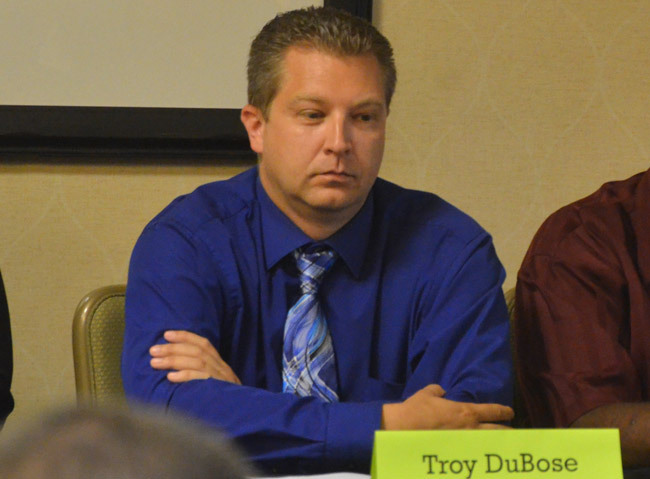 Troy DuBose, one of four candidates for the District 1 Palm Coast City Council seat, has withdrawn from the race. “I’m dropping out,” he confirmed in a brief interview, shortly after posting the announcement on his Facebook page. The decision has immediate implications for the swifter filling of the District 1 seat: the Aug. 30 primary could decide the winner should he clear the 50 percent threshold. The seat’s current holder, Bill McGuire, is resigning on Aug. 15, two and a half months ahead of the end of his term. If the August primary produces a clear winner, the council can then choose to appoint the winner to McGuire’s seat early, dispensing with going through the motions of seeking out a formal appointment. McGuire’s resignation created a quandary for the rest of the council, which is required by charter to fill the position by appointment within 30 days of the resignation. Council members are reluctant to do so with only a few weeks between then and the time in early November when an elected council member is seated: whoever is chosen would only serve for a few meetings. The Aug. 30 vote could more cleanly resolve the issue. With DuBose withdrawing, it reduces the candidates in District 1 to three–Bob Cuff, Sims Jones and Arthur McGovern Jr.. It is, in essence–as even Cuff sees it–a two-way race between Cuff and Jones: McGovern has been “a mystery candidate,” as Cuff described him, not appearing at any campaign forums, not responding to interview requests, barely making his presence known through signs, other campaign materials, a web or social media pages, and otherwise not taking his campaign seriously. McGovern is not expected to garner too many votes, thus increasing the chances that the race will be decided between Cuff and Jones. The Palm Coast City Council is scheduled to discuss the method of filling McGuire’s seat at its regularly scheduled meeting this evening, at 6:30 p.m. DuBose’s announcement will make that discussion easier in anticipation of a swifter determination of the District 1 race. DuBose’s name (and of course McGovern’s) will still appear on the Aug. 30 ballot, Kaiti Lenhart, the Flagler County Supervisor of Elections, said this morning. “We are in active voting,” she said, with the ballots printed and voting by mail already under way. But no matter how many votes DuBose gets, those votes will not be tallied, nor will they be published as part of election night’s totals, nor will they play into the calculation of total votes cast for the other candidates. The percentage of votes each of the remaining candidates gets will be based exclusively on those three candidates’ totals. The Aug. 30 primary could result in a clear winner, sparing the council the tortures of an appointment for the seat Bill McGuire is resigning. DuBose, 42, is the third candidate who had qualified but is no longer part of the Aug. 30 tallies: Chris France on July 21 withdrew from the circuit judge race in Group 4 (in which all Flagler County registered voters may cast a ballot, regardless of party affiliation), leaving only Sebrina Slack and Stasia Warren as viable candidates in that race. On July 22, Frank Meeker, the Flagler County Commissioner, died. He was on the ballot as a Republican Party precinct committeeman. Votes for him will no longer be counted. Lenhart had not yet received DuBose’s withdrawal letter this morning, which would be turned in first to Virginia Smith, the city clerk in Palm Coast, then forwarded to the supervisor of elections. (“Nothing yet but I am expecting it,” Smith said this morning in an email. The letter arrived in the afternoon.) Once that’s done, all vote-by-mail ballots will include a notice that DuBose, Meeker and France are no longer eligible candidates. The notice will appear in all voting booths during early voting and on election day. DuBose’s decision was expected after he’d signaled in various ways over the past two weeks that his interest in the race had waned, and that he preferred to serve on the Flagler County Planning Board. His lone application was before the county commission Monday for that appointment. The administration withdrew the application at the last minute because several commissioners and the county attorney had been unaware that DuBose was still at that point a candidate for office, and his application for an appointed government advisory board would have been inappropriate, creating “election code implications,” according to County Attorney Al Hadeed. DuBose and Hadeed spoke at length Monday after the commission meeting. DuBose should have first withdrawn from the Palm Coast race before submitting his name for an appointment. He said he will now do so, with his application to the planning board expected to re-emerge later this month. Jones and Cuff both welcomed the news even as they complimented DuBose. “I’m going to miss Troy, but it’s a blessing for me, and just one step closer for me to being able to help the people of Palm Coast,” Jones said. He spoke of being sad to seeing his rival go but in the same sentence said “it makes it better for me.” He was puzzled, however, as to DuBose’s decision to opt for a planning board seat as opposed to a council seat, which Jones considers more important for city residents. DuBose would not elaborate about his decision to withdraw this morning, but said he would speak of it some other time. The seat DuBose would be filling on the planning board is that of Pam Richardson, who resigned to run for Palm Coast City Council. Richardson is an ally of Nate McLaughlin, the county commissioner. It is McLaughlin who recruited DuBose. Palm Coast can not afford to have Sims Jones elected. He would be a disaster to local office. Troy, I’d like my campaign contribution back, please. You just sold your soul to the devil. The corruption on this council just never ends, does it? Layla, I couldn’t agree with you more. Troy has sure lost a lot of support and respect he once had. I am glad we know now where his soul rests before he is ever elected into public office. He would never get a vote from me, even for dog catcher. I must say it looks very suspicious to me that he has elected to drop out of the race in favor of a position on the Planning Board. That usually means somebody talked you out of running and offered you a deal. The best we can do here is to hope that is not the case. He does have a family to feed. However, this is one of the most key positions in Palm Coast and not easy to come by…..there I go again…..shame on me! That aside, I was impressed with Mr. Debose and will continue to be, I hope. He offers much to this community. But if he was talked into a deal, well…..then this is not the change we were hoping for. Forgive me for my thoughts, Mr. Debose. I still have high hopes for you and wish you the very best.